You can compare the effectiveness of different versions of your salesletter by employing a split-test. A split test is when visitors get sent to two versions of your salesletter. Each version of the salesletter is typically on a different page. For example, you might have index1.html and index2.html. The first step is to create 2 campaigns like you would create any campaign. The trick is, one campaign will have the destination url index1.html, while the other campaign will have the destination url index2.html. Be sure to check the box that says “Split Test Stats Only” so that these campaign do not show up in the main statistics report. Also, choose “clicks and sales” for the campaigns’ purpose. 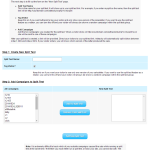 The next step is to fill out the form on the “New Split Test” page. Keep this on if you want Adtrackz to tag your visitor and only show one version of the salesletter. If you want to use the split test feature as a rotator, you can turn this off and your visitor will always be shown a random campaign within the split test group. Add the two campaigns you created for the split test. When a visitor clicks on http://yourdomain.com/adtrackz/st.php?s=mysplit he or she will be sent to one of these campaigns. After your split test is created, a link will be provided. 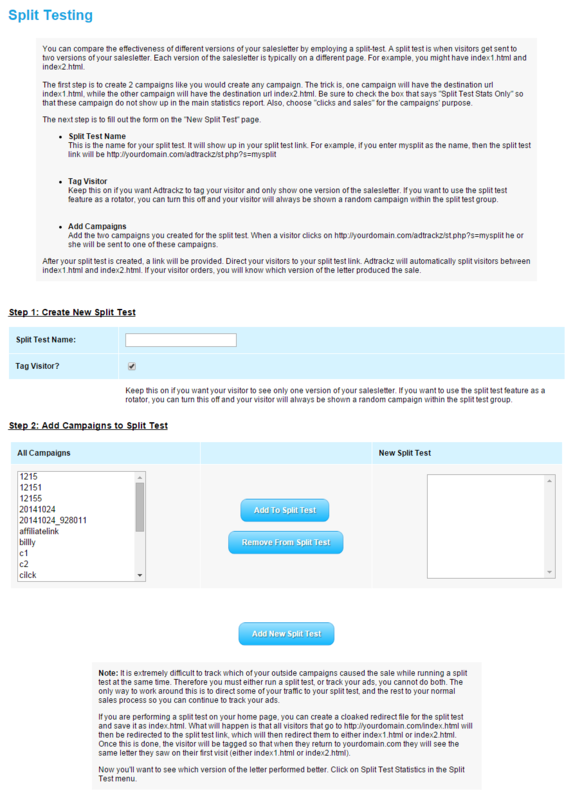 Direct your visitors to your split test link. Adtrackz will automatically split visitors between index1.html and index2.html. If your visitor orders, you will know which version of the letter produced the sale. If you are performing a split test on your home page, you can create a cloaked redirect file for the split test and save it as index.html. What will happen is that all visitors that go to http://yourdomain.com/index.html will then be redirected to the split test link, which will then redirect them to either index1.html or index2.html. Once this is done, the visitor will be tagged so that when they return to yourdomain.com they will see the same letter they saw on their first visit (either index1.html or index2.html). Now you’ll want to see which version of the letter performed better. Click on Split Test Statistics in the Split Test menu.